In the last 20 years, Bac Ninh province in the Northern Key Economic zone has grown from an agricultural community to a major industrial center with the second-highest per capita income and one of the highest economic growth rates in the country. Surrounded by major economic centers such as Hanoi and Hai Phong, it has managed to establish itself as one of the major FDI destinations. The province has grown by an average of 15.1 percent on average for the last 20 years, the highest in the country. In 2016, the gross regional domestic product (GRDP) grew by 9 percent. Industrial production value and export turnover ranked second in the country, with industrial value accounting for almost 75 percent of the GRDP. The industry-construction sector accounted for 74.3 percent, while the services sector accounted for 20.7 percent of the economy. Agriculture, forestry, and aquaculture accounted for 5 percent. The GRDP in the first 9 months of 2017 grew by 15.9 percent compared to same period last year. Industry and construction sector accounted for 75.2 percent, while the services sector accounted for 21.8 percent. Agriculture, forestry, and fisheries only accounted for a mere 3.0 percent. The industry and construction sector grew by 18 percent, while the services sector grew by 9.8 percent. Agriculture, forestry, and fishery sector growth reduced by 1.2 percent compared to the same period last year. In 2016, total export turnover stood at US$ 22.8 billion, while in the first 11 months of 2017, it has already exceeded that and currently stands at almost US$ 30 billion. As of now, Bac Ninh’s exports account for 14.9 percent of total national exports. 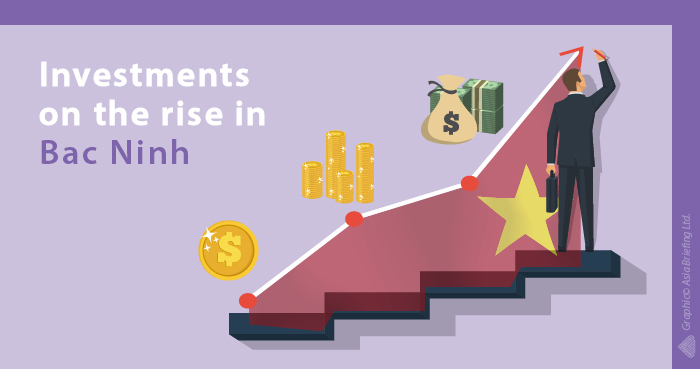 The cumulative FDI in Bac Ninh currently stands at US$ 15.8 billion invested in 1,102 direct investment projects from 32 countries, making it one of the leading FDI destinations. It ranks sixth amongst 63 cities and provinces nationwide in FDI attraction. Foreign investments mainly focus on manufacturing and processing, with registered capital for the sector accounting for 96 percent of the total invested capital. Out of the total, Korea alone invested US$ 10 billion. The FDI sector has been the main driving force in the transformation of Bac Ninh into an industrial hub, accounting for over 85 percent of the industrial production value and 99 percent of total export turnover. FDI in 2016 stood at US$ 924.9 million, while in the first 10 months of 2017, the province attracted US$ 3.28 billion, with Samsung being the major investor. In line with its expansion plans, Samsung Display would be investing US$ 2.5 billion in the province. It has six plants in Vietnam, with three in the Bac Ninh province. Other major firms in the province include Canon, Nokia, Pepsi, and ABB. According to the Provincial Competitiveness Index 2016, Bac Ninh ranks the 17th most competitive province in the country. The rankings were led by Da Nang, Quang Ninh, and Dong Thap. In addition, the province ranked 10th in the Infrastructure Index in the Provincial Competitiveness Index 2016. Infrastructure surveyed included industrial zones, roads, energy/telecom, and internet connectivity. The region also emerged as the seventh most attractive place for future investors, with Ho Chi Minh City, Da Nang, and Hanoi leading the scores. Bac Ninh lies on the economic corridor of Nam Ninh – Lang Son – Hanoi – Hai Phong – Ha Long and connects the administrative capital Hanoi with the Northern midland and mountainous provinces. It lies only 30 km from Hanoi, 45 km from the Noi Bai International Airport, and 110km from Hai Phong, a major industrial city with one of the largest seaport. The province has over 4,000 km of roads and is well connected with regional neighboring provinces through the 1A national highway linking with Ha Noi – Bac Ninh – Lang Son; highway No.18 connecting the Noi Bai International Airport with Bac Ninh and Ha Long, and national highway No. 38 connecting Bac Ninh, Hai Duong, and Hai Phong. In addition, the highways are well connected to the provincial and commune roads. The cross-national railway system in the province runs through Bac Ninh to Lang Son in the north leading further to China. The province is well connected through regional river ports and seaports on the Cau River, Duong River, and Thai Binh River. Bac Ninh has 16 industrial parks, with nine of them fully operational with an occupancy rate of 87 percent, spreading over 8,000 hectares. The industrial parks in the province have attracted major infrastructure firms such as Vietnam-Singapore Urban and IP Development Joint Stock Company, Kinh Bac Urban Development, Song Da Corporation, and IDICO Corporation who provide infrastructure facilities and services. The industry and construction sector accounts for the majority of the firms in the region, followed by the services sector. Industry and construction sector is expected to grow by 12 percent, while the service sector is predicted to grow at 14 percent in the next three years. To ensure a sustainable development, the province is pushing for investments in high-tech industries and environment-friendly projects. Firms in the electronics, information technology, infrastructure development, chemical, and industrial automation industries will find Bac Ninh an attractive location. In addition, due to the presence of major manufacturers, supporting industries will also find the province as a favorable option. The provincial government has to continue prioritizing the electronics manufacturing industry in the region. It has been a major source of FDI, employment, and income growth and has the potential of making the province an electronics hub not only in the country but South East Asia as well. However, this does not mean that one should overlook the services and especially the agriculture sector. Overdependence in the manufacturing sector has its own drawbacks. In the agriculture sector, the province should focus on the rural economy and help them increase the productivity and quality of their products to ensure higher incomes. In addition, linking them with major markets such as Hanoi and other urban areas would also lead to an increase in their income. Although the region has one of the highest income per capita in the country, the income gap is rapidly increasing between the rich and poor, and the government has to ensure that the region’s growth is inclusive of all socio-economic classes.